Since there have not been any professional polls done we will look at social media polls and other sources. 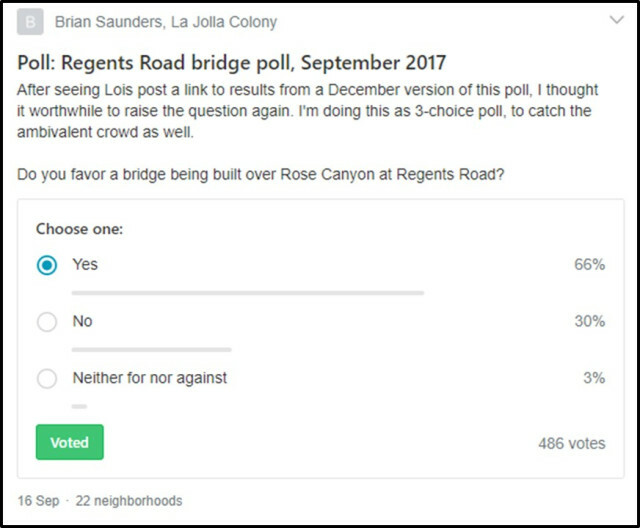 Recent polling done on Facebook and NextDoor are remarkably consistent in favor of building the Regents Road Bridge. Please consider donating to our campaign today! This video is a compelling piece of San Diego history. On August 1, 2006 San Diego’s City Council voted 6-2 to proceed with the Regents Road Bridge project. The video highlights key speakers on that day who advocated the bridge project and Council Members who voted to complete Regents Road. Since that day a small but vocal minority political group and a few key politicians have thwarted the will of the people in our region in San Diego by rationalizing a lack of action to complete Regents Road. We have filed a legal action against the City regarding their EIR and Statement of Overriding Considerations based on California Environmental Quality Act (CEQA) law. We need everyone’s help to meet the expenses we are expecting in order to go to trial with this lawsuit. Perhaps you were busy, out of town, or stuck in traffic on Genesee. Great news!!!! Another benefactor has stepped forward with another matching pledge. This new benefactor has also pledged $10,000 towards our legal campaign to match all donations of $100 or more. If you gave previously, thank you! Please share this news with your friends and consider donating again. If you haven’t given yet – now is your opportunity to double your contribution of $100 or more. This incredible opportunity means that your donation has double the impact to our fundraising campaign. In other words, $10,000 in donations becomes $20,000! In our last matching funds goal we raised enough to get the full match… It’s time to do it again! The matching funds will be posted and announced when the full $10,000 has been matched. We're in crunch time to raise the legal fees needed, but we can do it with your help! Following the City Council’s 6-2 decision to remove the Regents Road bridge from the Community Plan, Citizens For The Regents Road Bridge (CFTRRB) filed a lawsuit against the City of San Diego citing inadequacies in the Program Environmental Impact Report (PEIR) and violations of the California Environmental Quality Act (CEQA). Note: The City Council ignored the City Planning Commission’s 6-0 vote RECOMMENDING the Council KEEP the Regents Road Bridge in the plan and BUILD it. The Regents Road Bridge has been in the community plan for over 40 years. It is the MISSING PIECE IN THE MULTIMODAL TRANSPORTATION REGIONAL NETWORK. Most, if not all, of the development in the area north of Rose Canyon was based upon the bridge being built as part of the necessary infrastructure. Our region needs the REGENTS ROAD BRIDGE to improve public safety, alleviate traffic congestion, reduce greenhouse gas emissions, shorten emergency response times, and provide a critical second north/south arterial route. Also, in order to comply with San Diego’s Climate Action Plan, Master Traffic Plan, and Master Bike Plan, the City MUST build the Regents Road Bridge. Note: The money raised IS PRIMARILY for Legal representation and filing fees. Your contributions will be tax deductible as we have now filed as a 501(c) (3) non-profit corporation. According to the IRS, while an application is pending, the organization can treat itself as exempt from federal income tax under section 501(c)(3) and donations would be tax deductible for income tax purposes. We must tell you that in the unlikely case that the application is rejected, those donations under our pending 501 (c) (3) application would lose their tax deductibility. Total just updated with $6,350.00 in matching funds. Still some matching funds left for donations of $100 or more!!! #GivingTuesday - Citizens for the Regents Road Bridge (CFTRRB) has been approved to be a tax exempt public charity under Internal Revenue Code (IRC) Section 501 (c) (3). We received this good news in mid-November and the IRS’s approval of our application is effective as of June 7, 2017. Donations to CFTRRB by all taxpayers are now tax deductible. Please forward to your friends and consider donating today! 66% in favor of building the bridge!